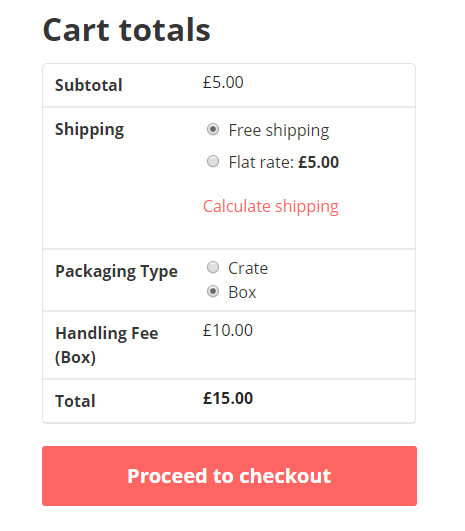 I would like to add handling fee on cart/checkout page with options just like the shipping options. Where customer can choose their packaging type from multiple options. Here is an example of the frontend. I tried to trigger wc_update_cart, but seems like its not sending my custom fields value. There is the Woocommerce Documentation article: Add a surcharge to cart and checkout – uses fees API. Examples are taken from there, no credit whatsoever goes to me. Not the answer you're looking for? Browse other questions tagged woocommerce jquery or ask your own question. How to get selected variation for a product in WooCommerce Cart Page?